What do you remember most about third grade? 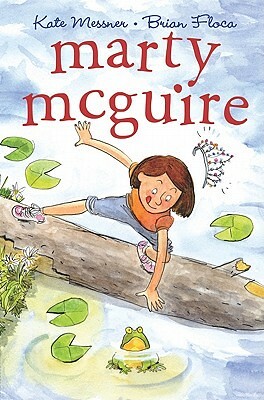 Kate Messner, author of the newly released MARTY MCGUIRE, wants to know! Marty would rather spend recess catching frogs in the pond than playing dress-up with the other girls in third grade. So when her teacher casts Marty as the princess in the class play, Marty’s absolutely, positively sure that there’s been a huge mistake! But after a special lesson in the art of improvisation, Marty comes up with her own plan to improve the play. Why use a stuffed-animal frog onstage when a live one would be so much better? In the end, Marty’s one-of-a-kind performance makes for an unforgettable show. Maybe Marty can live happily ever after, after all! I loved Kate’s THE BRILLIANT FALL OF GIANNA Z and SUGAR & ICE, so MARTY MCGUIRE is going to the top of my list. In celebration of Marty’s debut, Kate asks: “So… isn’t that at the heart of third grade? Improvising? Trying out new things (and winging it when something unexpected happens)?” In response, she’s encouraging us to dust off the archives and share a third grade memory of our own. Eight years old. Feathered bangs. Future bride of Michael Jackson. Yep, it was the eighties, and I was ready to take on the world. Or at least the classroom. My teacher, Mr. Vuich (pronounced vyoo-itch), had a full beard but a gentle manner and an endless collection of pink ties, pink shirts, and yes, even pink pants. You could call him a trailblazer and you wouldn’t be wrong. I thought he was super old, like fifty, but he was probably only marginally old, like thirty. Yeah is right. Monster cookies? Yeah, yeah, hella-yeah! Our wily brood spent the entire morning making sugar cookie cutouts in the likeness of our favorite scary monsters. And of course by scary I mean deformed, but you know, we were only eight. We put them on trays and then picked out our planned decorations from the sugary buffet before us. There was frosting — white, pink, yellow, and blue, but I swiped some additional red and blue food coloring to hand-tint my own special shade of screaming purple. There were black and red licorice ropes for hair, M&Ms and gum drops for eyes, candy corn which nobody liked but made the best pointy noses, and raisins which no one touched because Brian Sours (real name) told us they were dead flies with the wings pulled off, which unleashed a slew of “Hey Brian Sours, can we use your face as a scary monster mold?” jokes. All in all, it was a great idea. Score one for Mr. V.! He loaded trays of our raw cookies on an AV cart and shipped them to some mysterious place for baking — probably the school cafeteria which was filthy and smelled like Spaghettios — and then sent us out to the playground with another class for fifteen to eighteen minutes. Sadly, during those precious few minutes, all of our monstrous hopes and dreams were dashed on the sad rocks of reality. We returned from the playground, rosy cheeked and eager to decorate or creations. But as we filed into our seats, we noticed the classroom did not smell of fresh baked monster. Mr. Vuich perched his pink-panted little bottom on his desk and sighed. Nearly thirty years later, I haven’t forgotten those four little words, the utter defeat in his voice, the guilt in his eyes, the despair on his shoulders like a yoke. The class gave a collective gasp. Mr. Vuich slumped further. And then he rose, crossing to the back of the room where a row of Super Duper (real name) grocery bags glistened on a windowsill in the high afternoon sun. Well, they more likely just stood there not doing anything because they were still brown paper back then, which doesn’t glisten. But in my mind they glisten. Yeah is right. Yeah, yeah, hella-yeah! We spent the rest of the afternoon decorating and eating. Trading and eating some more. And laughing, because monster grahams? Win! And readers? I hope you’ll check out more third grade antics, improvisation, and of course, charm in Kate’s new release, MARTY MCGUIRE! If you have your own third grade story to share, head on over to Kate’s blog for more details on how you can enter to win a signed copy of her latest book. A cupcake bar! A cupcake bar! It just opened last weekend, and I went there tonight with Alex, my brother Scott, and his girlfriend, Alanna. Here… I brought some cupcakes back for the ninjas. You deserve them! Enjoy! Lavender cupcake with lavender buttercream frosting: The flavor took me a minute to get used to. I love the smell of lavender, but I’m used to smelling it in soaps and lotions and girly bath stuff. But once I got over that, this was quite delish! Peanut butter cupcake with chocolate buttercream frosting, peanut butter Captain Crunch, and chocolate chips: Sadly, I wasn’t quick enough to taste this one. Pet monster… he ated it! Spicy chocolate cupcake with orange chocolate ganache and pink confetti hearts: NomNomNom. I love spicy chocolate anything, orange chocolate anything, and pink hearts are just the icing on the… icing!